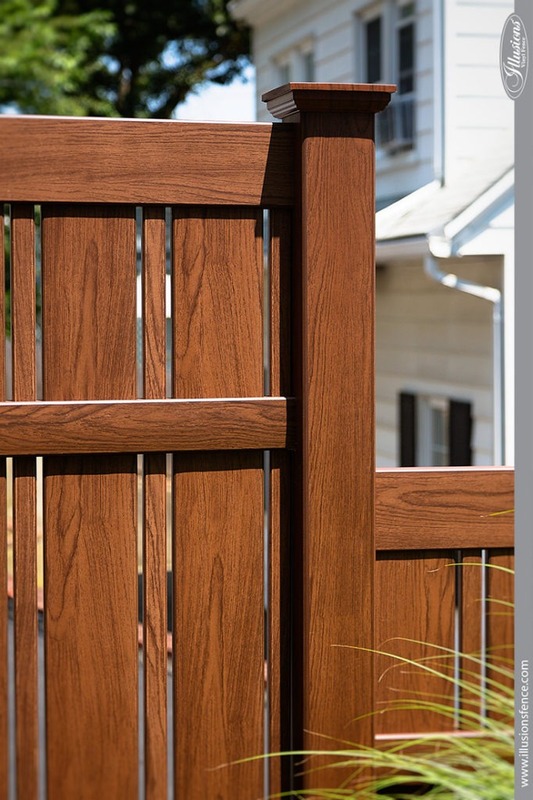 Looking for the best fence? Try Grand Illusions Vinyl WoodBond Rosewood. Looks like wood. Lasts like vinyl. What is the Best Fence in the Industry? This question gets asked a lot and many companies will give you their own personal answer as to why they believe they are the best. This is our answer as to why we believe Illusions Vinyl Fence is the best fencing brand for the best fence prices in the industry. 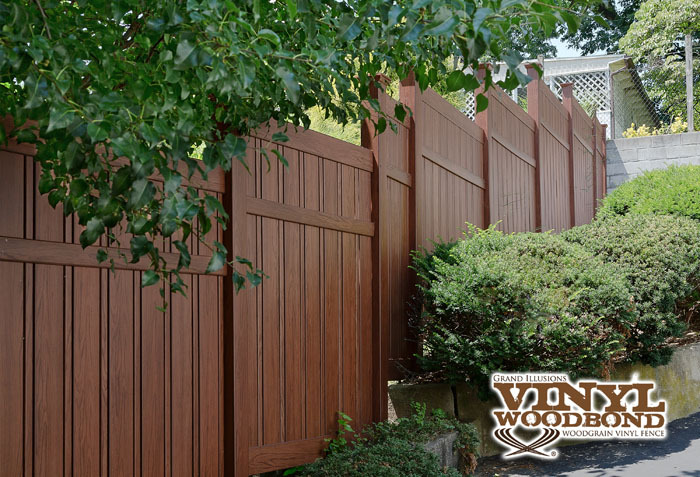 What brand gives you hands down the most choices of terrific, high quality vinyl fencing products in the most color and wood grain fencing? It’s simply Illusions Vinyl Fence. 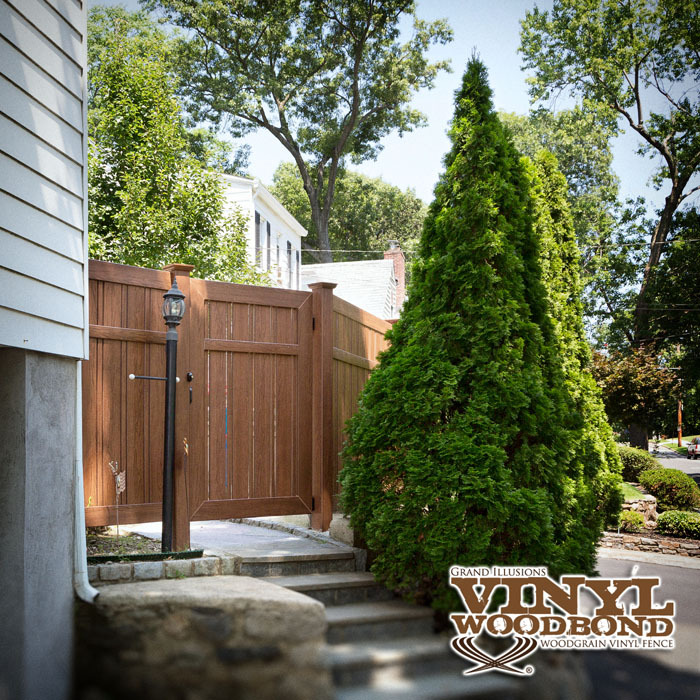 Over 60 standard styles of vinyl fencing that can be mix and matched in 35 colors and 5 authentic woodgrains. No other company can come close to the available choices of colors, styles, and wood grains. Not only that, Illusions is made from 100% Pure Virgin Vinyl and is F964-13 compliant. Want to find out more about the terrific quality of Illusions Fence? You want Black boards and lattice with Rosewood posts and rails? We’ve got you covered. 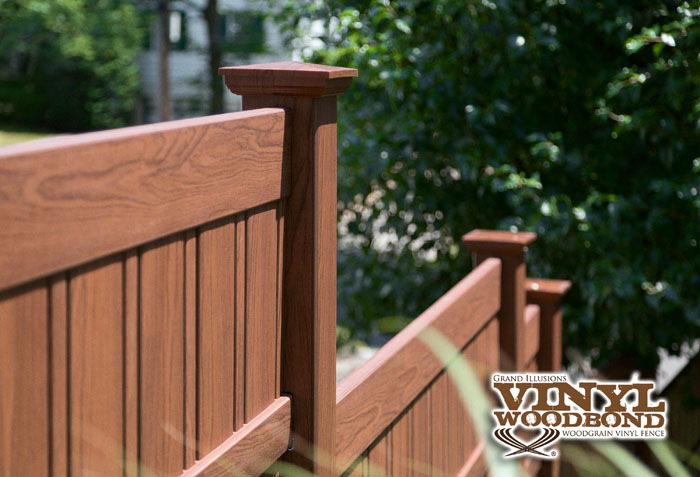 You want a no-maintenance wood fence (Made out of PVC)? No problem. 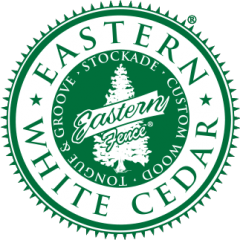 Check out the spot-on Eastern White Cedar Grand Illusions Vinyl WoodBond. Looking for a Black PVC picket fence with a matching black pergola for your New England style dream home? We’re your brand. Looking for a matte finish white vinyl PVC fence with NO SHINE? Yup. Grand Illusions Color Spectrum White (W101). All of these terrific choices are available to you through the Grand Illusions Color Spectrum and Grand Illusions Vinyl WoodBond product lines. Want to see more pictures? Check out the GALLERY. The choices are endless. There is even an app available for Apple, Android, PC, and Mac created for the specific purpose of helping you choose which style and color combination is best for you. Check out the Illusions Fence Designer App. This particular install of Grand Illusions Color Spectrum Rosewood (W104) is a perfect example of how the Grand Illusions products are changing the face of American landscaping one yard at a time. There was a pretty serious grade on this property that the installers handled like champs. 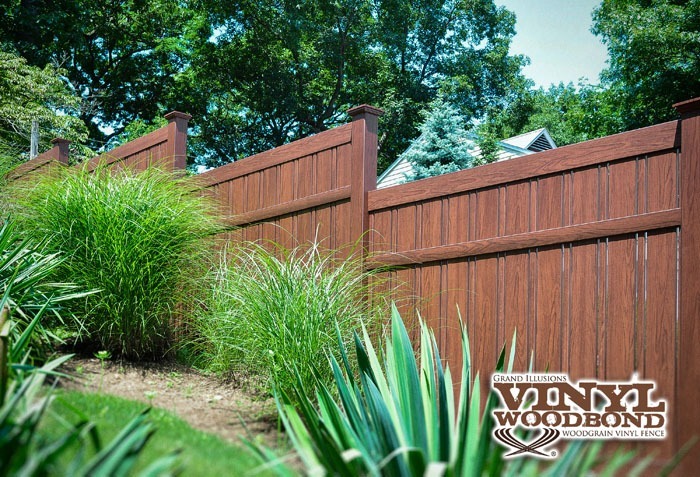 This particular style of fence is the popular Illusions V500A-6 Semi-Privacy with Alternating 1-1/2″ & 6″ Wide Boards. Shown in Grand Illusions Vinyl WoodBond Rosewood (W104). Many styles of Illusions Vinyl Fence (and Grand Illusions) will rack a pretty decent amount as well. In this instance and with this style though, the installers chose to step. 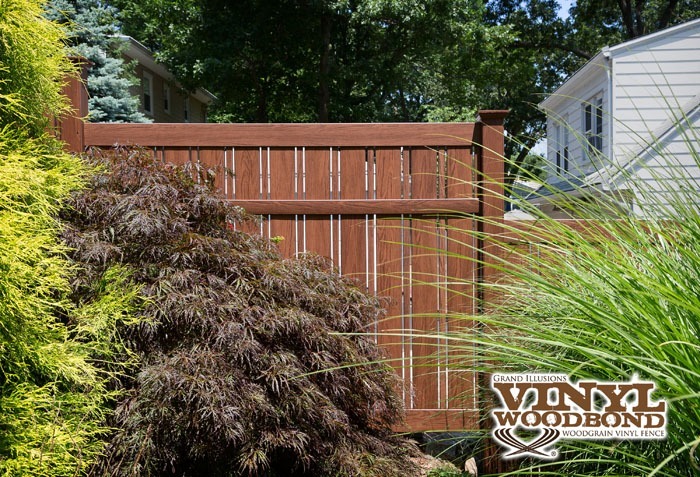 Illusions Rosewood vinyl fence offers a rich, textured look to the already attractive landscaping elements. With Illusions Vinyl Fence products, we feel that great ideas come from the heart. 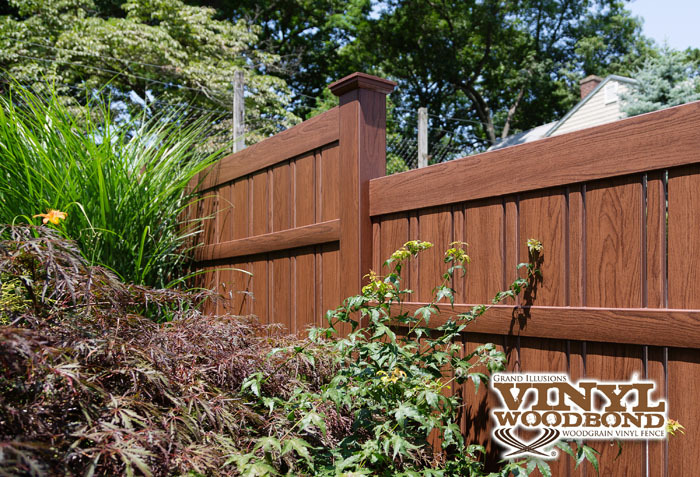 A fence that looks like stained wood fence, but has the low maintenance of vinyl is the next step in the evolution of fence. We believe it’s Grand Illusions by Illusions Vinyl Fence. Available in 35 colors and 5 authentic woodgrains. The choices just keep coming. This is a fun and interesting install by King Fence of Yonkers, NY. (Recently featured in the “Best Grand Illusions Display” video email a couple of weeks back).